On Tuesday, April 16, one of our designers, Sandy, volunteered to help during the morning shift at the 2nd Annual Swing Fore Sight Golf Tournament at the Piedmont Driving Club. The purpose of the tournament was to raise awareness of and raise funds for Prevent Blindness Georgia, a nonprofit organization that screens children for eye disease and travels to communities in Georgia that have limited access to eye clinics. One of our clients, Dr. Jonathan Woolfson was being honored at the tournament, so we were compelled to participate (golf isn’t our game, but we are good volunteers!). The Woolfson Eye Institute Team is Ready to get on the Course for a Great Day of Golf! The owner of Haven, a new state-regulated medical cannabis dispensary in Brandywine, Maryland commissioned LeVino Jones Medical Interiors to provide design services for their new facility. Services included space planning consultation and modifications; interior design documentation; cabinetry, lighting, furniture, finishes, and product display services for this unique specialty pharmacy. Different from a recreational cannabis “shop”, a medical pharmacy dispenses medical-grade cannabis product in many varied forms using a physician’s prescription. Products used for ingestion (pipes, vape pens, tinctures, rolling paper, etc.) are sold in this pharmacy as well. In a medical cannabis pharmacy, entry, product selection and “shopping” are carefully controlled and include a robust security protocol and surveillance. Additionally, many display items, including ‘product’ are no-touch. This pharmacy owner, a Board-Certified physician, wanted a clean, modern and professional look. Inside the dispensary, brand colors were used only as an accent to allow the product to stand out against the crisp, white, modern finishes and lighting. The design concept is based on elevating the professional appearance and ambiance of the space while the pharmacy, staff and services elevate the professional delivery of medical cannabis to the community. LeVino Jones Medical Interiors participated recently in a room makeover for “Sunshine on a Ranney Day” (SOARD), a registered nonprofit organization in Atlanta. SOARD provides fun and uplifting dream bedrooms, bathrooms, and therapy rooms, for children with special needs. Our client was Juliana, an energetic and cheerful 15-year old with Cerebral Palsy, who wished to become more independent in her bedroom and bath. LeVino Jones Medical Interiors, Inc. participated in the 2018 ASID “Going Global” Student Day at ADAC on January 26, 2108. The theme for this year’s event, “Going Global”, is based on the belief that understanding different cultures allows us as designers to leave our mark worldwide with thoughtfully designed spaces. 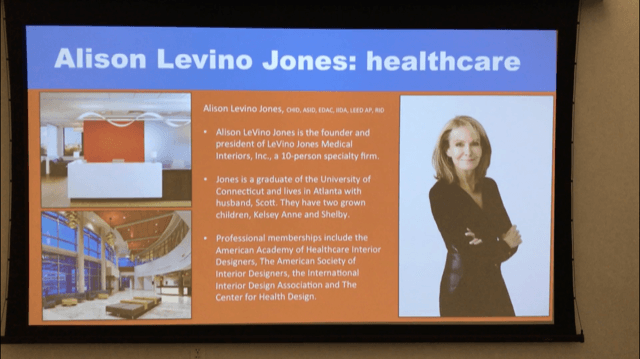 Alison Jones, ASID owner of LeVino Jones Medical Interiors, Inc. participated in an event called “Group Discussions with Atlanta’s Top Design Professionals”. In this event, Alison and other professionals with specialty practices and services met with student groups in a “speed-dating” format of seven minutes each. Alison spoke with each group about the nuances of healthcare design and the broad range of projects that encompass healthcare design today. Amachi MedSpa opens its doors! Dr. Stanley Okoro and his staff hosted an Open House and “unveiling” for their new 2,108 square foot medical spa suite in Marietta. The new Amachi MedSpa location, affiliated with Georgia Plastics and Reconstructive Surgery and Asuch Surgery Center was relocated from the main floor clinic to a ground floor area that previously served as storage and utility space. Designed by LeVino Jones Medical Interiors, the newly transformed suite now includes a reception center with refreshment bar and product display, four treatment rooms, a massage room complete with a steam shower and two separate guest lounges. The design of the suite layout focused on an efficient workflow, maximizing a small footprint to create a full medical spa with unisex services and a clean, fresh color scheme. Spa-like features at the entry include a textured pebble stone accent logo wall, a beautiful quartz transaction ledge and stone tile flooring. Are you looking for ways to more efficiently plan your next medical office suite? Consider evaluating the amount of square footage that you plan to dedicate to non-revenue producing spaces, like the break, conference and classroom functions. First, look into available resources such as shared conference rooms which your building may offer to its tenants. Larger atriums or entry lobbies also can double as great after-hours meeting or event spaces. If a large space is available for conferencing, a mid-size conference room for in-house meetings, collaborative work and conferences would likely be sufficient. Many clients request a classroom for educational offerings like birthing classes, wellness seminars or similar educational events. They also request a break room which is designed to meet peak break times for staff breaks, product representative presentations & lunches and “lunch & learn” events. A space-saving approach is to combine the classroom and break room as one with chairs and tables that can be easily moved and rearranged to accommodate a classroom, conference or lunch break. Additionally, consider locating the break room next to the conference room and using a movable partition wall between the two spaces. This allows for expansion of the conference or classroom space into the break room. Proper location of electronics such as TVs or monitors, wireless equipment, outlets and speakers will enhance the flexibility of these multi functional and space saving areas. Check out these layouts below and decide what works for you! imedical space planning was an exhibitor-sponsor for the November 2017 Healthcare Real Estate Southeast Interface Conference in Nashville. imedical’s presence at this event allowed us to share the internet-based platform for national medical space planning with MOB owners, brokers and real estate groups. Our Best Work Never Shows! You can’t take a picture of good medical space planning. Without being visible, the thoughtful layout of a medical office or clinic saves staff time and footsteps; supports patient privacy and HIPAA regulations; controls acoustics and sound migration; directs patient flow; supports staff work flow; allows visual access where needed and makes a positive first impression. Expertly prepared medical office floor plans take these considerations into account well before any beautiful details, lighting, finishes or furnishings are considered. A medical practice runs as well as the space that supports it. Consider imedical space planning for your next new medical office, expansion or retrofit.